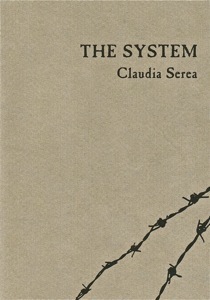 Claudia Serea’s compelling and emotionally prolific collection of poems, The System, recounts her father’s trials as a prisoner in a Romanian gulag during the 1950s and 1960s. Not only is the work a tribute to the author’s father, but it is also a testament to the political and social tumult and oppression that existed in the communist puppet state in the decades following World War II. The “system” that Serea speaks of takes on various meanings in both the writing and structure of the work as a whole. It refers most prominently to the political justice system (however ineptly named). The book itself, in a clever and shining technique, functions as a system—one that catalogs participants responsible for instigating suspicion of the father as well as members of the formal justice system who carried out his sentence. It also documents a system by which the father survived. The second section in the book is titled “My Father’s Quiet Friends in Prison 1958-1962” and consists of five objects the father used for meager comfort while imprisoned. This other system was concocted by the father for survival and introduced by the author as a system of helpers rather than oppressors—a thin veil of optimism in an otherwise bleak collection. “The Gruel” claims that it can be used for “glue, mortar, or clay,” as well as food. “The Blanket” tells the father that while it does a poor job of keeping him warm or comforting him, it may be used as a chess board for entertainment purposes. “The Piece of Glass” serves as a writing tablet. “The Small Stone” is a tool for communication. And, finally, “The Moon” is a spiritual nexus—a source of hope in a hopeless place. The book ends with a second “The Informant” poem, suggesting that the injustice suffered by Romanian citizens was cyclical and that Serea’s father was only one of many people falsely imprisoned. He would certainly not be the last. Serea uses simple language coupled with understatement to voice difficult subject matter. The System is ultimately about the endurance of the human spirit in the face of an ultimate evil.